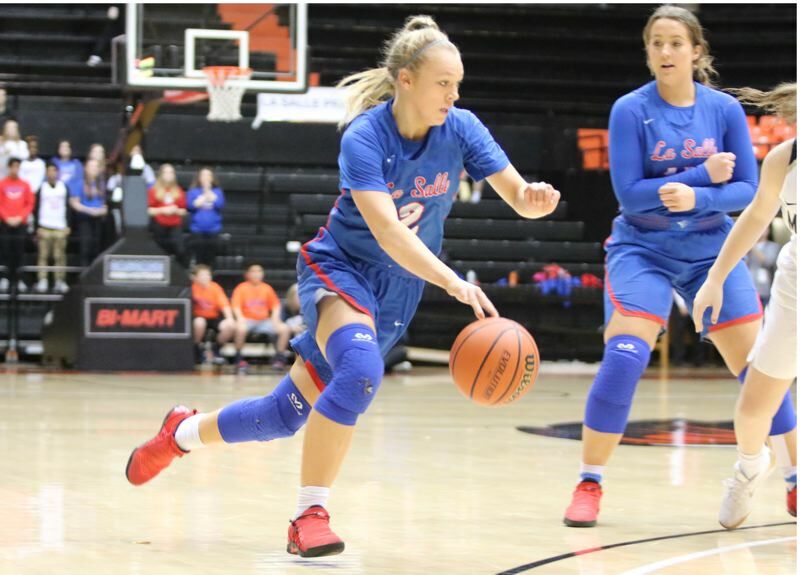 CORVALLIS -- With all the adversity that La Salle Prep's girls' basketball team endured this season, it was a wonder that the Falcons were one of the two teams still standing in Gill Coliseum on Friday night. The Falcons' goal was to defy the odds once again and take down top-ranked Marist Catholic and repeat as Oregon School Activities Association Class 5A champions. Marist had answers for everything La Salle Prep threw its direction as the top-ranked Spartans rode a stellar defense and Emma McKenney's game-high 19 points to a 59-44 victory over the defending champion Falcons. Madison Ficek added 12 points, and the Eagen sisters -- Claire and Lauren -- had a combined 12 points, 14 rebounds and four blocked shots as the Spartans (25-3) claimed their fourth state title and first since 1999. "I'm just so happy and delighted for our kids," Marist coach Terry Harrison said. "They worked so hard for this, and this is just a dream come true for them." La Salle's Taycee Wedin finished with a team-high 13 points, and Kylie Burg added 12 points, seven rebounds and three assists as the Falcons ended the season at 22-5. "Hats off to Marist," Falcons coach Kelli Wedin said. "They put together one of the best games I think they've put together all year. I thought that's what it was going to take to beat us and they did it, so credit to them. They were the better team today. "This game doesn't define us. It doesn't take away from anything that we've done this season. It's just painful." There were six lead changes in the first half before Ficek, Marist's junior guard, knocked down a 3-pointer from the right corner with five seconds left to give the Spartans a 29-25 lead at the break. Marist then threatened to break to the game open when La Salle came away empty on its first six possessions of the third quarter and the Spartans went on a 9-0 run to take a 38-25 lead. But the Falcons weren't finished. They chipped away behind Burg, their 5-10 sophomore, who had seven points and an assist during a 14-4 run that cut Marist's lead to 44-41 with 5:16 to play. La Salle's Emily Niebergall then grabbed a rebound off a McKenney miss and got the ball to Burg, whose 3-pointer from the left corner to tie was off the mark with 4:16 left. Marist got the ball back and worked the clock, taking more than a minute off before McKenna Williams went to the foul line and made two free throws that extended the lead to 46-41 with 2:54 to play. La Salle's Colby Jansen made one of two free throws to make the score 46-42, but after that the Spartans were content to play keep away, working the ball around the perimeter until the Falcons either surrendered an easy look at the basket or fouled. "How 'bout my kids' fight?" Kelli Wedin said. "They don't give up. They're relentless and they're resilient and they've been that way all year. We've had these same situations and they've weathered the storm and they'd fight back. "Unfortunately, a couple plays that could have changed the momentum didn't go our way, and sometimes it takes a little bit of luck on this big of a stage, and we didn't have it on our side tonight." After last season's championship run, La Salle not only lost three-time 5A Player of the Year Aleah Goodman to graduation, but also had two other starters transfer, and then had both of the coach's daughters -- senior Taycee Wedin and freshman Addison Wedin -- undergo off-season knee surgery for torn ACLs. Forced to redefine themselves, the Falcons made "D.T.O – Defy the Odds" their rallying cry as they went undefeated through the Northwest Oregon Conference for the fourth season in a row and scored consecutive playoff wins over Corvallis, Crater, and Bend to set up Friday's showdown with Marist. "Obviously it wasn't the result we wanted, but I wouldn't have wanted to have this journey with any other team," Burg said. "They're the best teammates I've ever had, and finishing second is still a big accomplishment. "Nobody thought we could do the things we did, and we proved everybody wrong. We made it here, and that's what's important." Taycee Wedin and Niebergall were named to the all-tournament first team along with McKenney of Marist, Maggie Roth of Silverton, and Cali McClave of Crescent Valley. "I know in the first half were were hanging our heads a little bit, but we talked at halftime and we came back the second half," Taycee Wedin said. "We had some slip-ups, for sure, but we gave it everything we had in the second half. "Right now, obviously, I'm disappointed. But nobody expected us to get this far under the circumstances we faced. Nothing was in our favor, but, honestly, I'm so proud of my team for making it this far. And we gave it everything we had."